iCloud is a default service provided for those who use iOS devices. 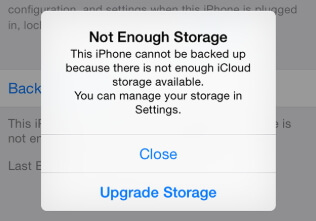 Initially, iCloud offers you a free storage up to 5GB. However, a storage of 5GB is not a huge space when you consider the stuff you have to store in your device. A space of 5GB can fill up pretty quickly with songs, videos, photos and other files you backup. If you face iPhone backup failed not enough space in iCloud, we have a best solution for you. One of our readers said that he couldn’t backup some of his important video clips to iCloud. He said he got a message saying “Not Enough Storage: This iPhone cannot be backed up because there is not enough iCloud storage available”. As we are aware, this is a very common issue faced by many iOS device users. If you are among one of those users, don’t worry; the possible solutions will be explained from this point onwards. Let’s see the most practical solutions to try if you face the above issue. 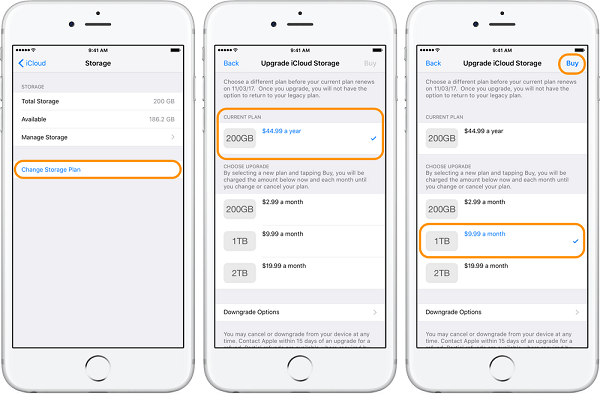 One of the easiest options to consider if you run out of iCloud storage is simply to purchase more space. Here’s how to do it on your iOS device. Step 1. Go to the Settings app and select your name. Step 2. Go to iCloud option and select Manage Storage or iCloud Storage accordingly. Step 3. For those who use older versions (iOS 10.2 or later) go to Settings and select iCloud, Storage. Step 4. Then, tap on the option “Buy More Storage”. If not, you can select “Change Storage Plan” option. Step 5. Select the plan you need and tap on “Buy”. Step 6. Complete the payment according to on-screen instructions. Although the above option might work fine as long as you are ready to pay. However, paying is not the preferred option for all the users. Some users don’t want to pay just because they need to use some extra GBs. This is when you should be looking for a better alternative. Thanks to the technology, there are several tools available for us to consider in terms of backing up data without iCloud. With the assistance of a good third-party data backup tool, you can keep your data protected. If you have created a backup, you will not face the risk of losing your important data even if the device is damaged or face a software glitch. By far, the best tool we can rely on as an iPhone data backup tool is iMyFone D-Back. This special tool comes with a variety of features to impress you. For instance, you can use iMyFone D-Back to recover or backup selective data. That means, if you need to recover or backup certain types of files only, D-Back can assist you. It can safely transfer your iPhone’s data into any computer without complex effort. More importantly, this tool doesn’t require you to install an app on your iOS device. Instead, the software will be installed on your computer and the device should be connected to it for the back up process. Let’s see how to backup the data on your iPhone with the assistance of iMyFone D-Back. Step 1.Start the program and select “Recover from iOS Device” tab and then click on “Start”. Step 2.Now, get the device connected to the same computer and click on the button labeled “Next”. Step 3.Specify the data types you intend to backup and select the option “Scan”. Step 4.At the completion of the scan, you will see a list of files that can be recovered. Select the files you need to backup and hit “Recover”. 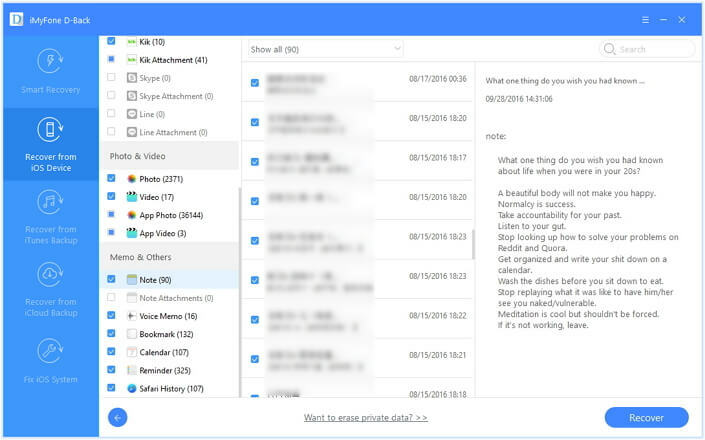 Now, choose a folder to save the files. Here’s a brief comparison of the two methods. We expect you to take a smart decision after reading the information on this article carefully. Go through the reviews of the two options as well and compare the pros and cons. Also, we highly appreciate if you can share your thoughts about this tutorial. How to Transfer Photos from iPhone to iPhone without iCloud?